Overview: PatH2Other Side intends to re-imagine the Detroit Superior Bridge as an iconic and dramatic piece that catches the citizens’ eyes and represents a positive ecological impact to the city. 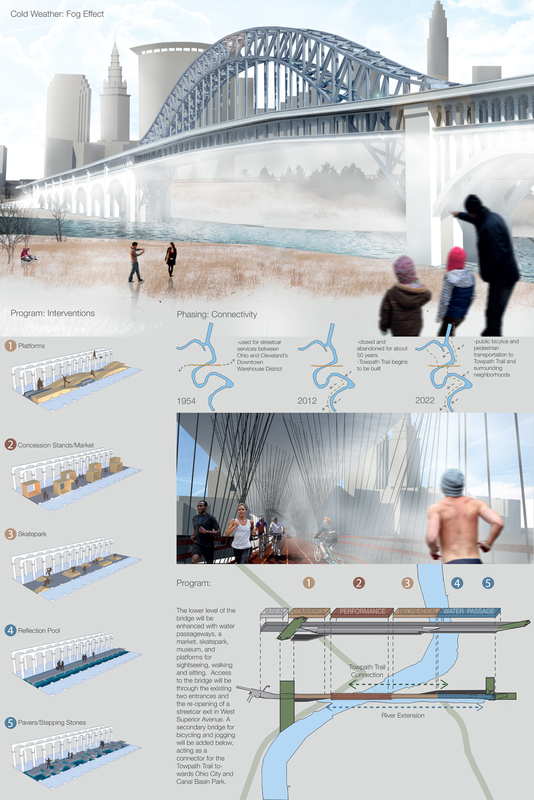 In the future, the bridge will solidify connectivity ties with surrounding neighborhoods and the Towpath Trail through public bicycle and pedestrian routes. 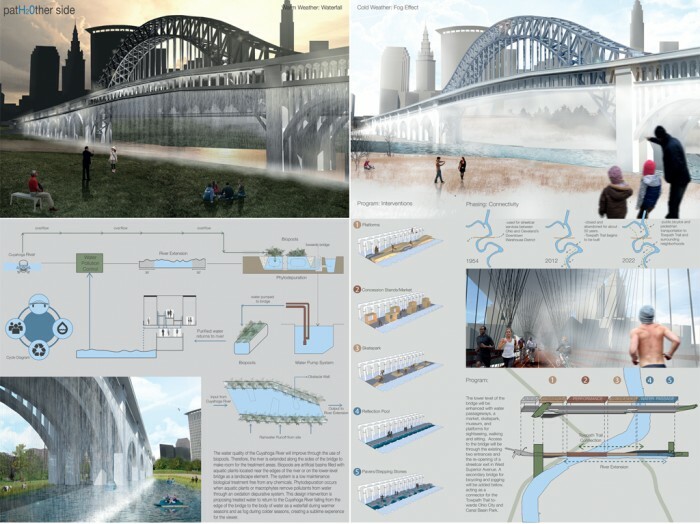 The lower level of the bridge will be enhanced with water passageways, a market, skatepark, museum, and platforms for sightseeing, walking and sitting. Access to the bridge will be through the existing two entrances and the re-opening of a streetcar exit in West Superior Avenue. A secondary bridge for bicycling and jogging will be added below, acting as a connector for the Towpath Trail towards Ohio City and Canal Basin Park. 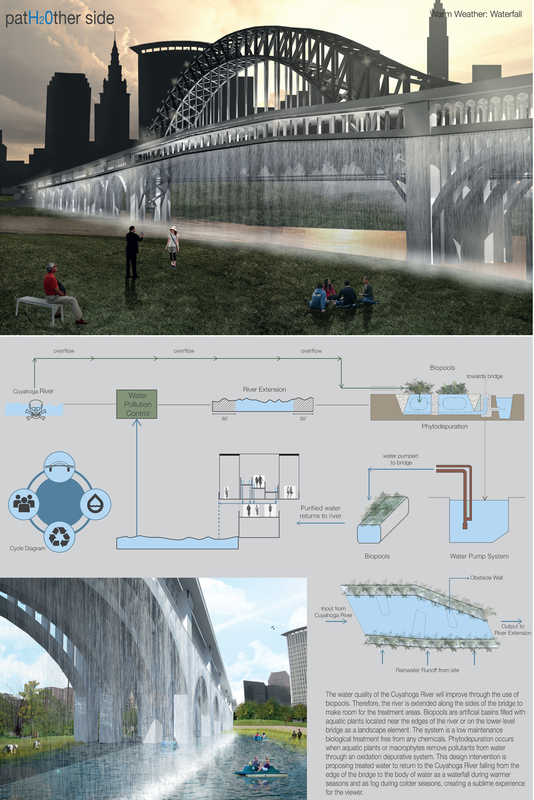 The water quality of the Cuyahoga River will improve through the use of biopools. Therefore, the river is extended along the sides of the bridge to make room for the treatment areas. Biopools are artificial basins filled with aquatic plants located near the edges of the river or on the lower-level bridge as a landscape element. The system is a low maintenance biological treatment free from any chemicals. Phytodepuration occurs when aquatic plants or macrophytes remove pollutants from water through an oxidation depurative system. This design intervention is proposing treated water to return to the Cuyahoga River falling from the edge of the bridge to the body of water as a waterfall during warmer seasons and as fog during colder seasons, creating a sublime experience for the viewer.